“Infestation” aside, it’s actually a nice little place. Located on a small plaza across from the University, the interior appears to be right out of the 1920s café movement: low ceilings, lots of brass and mirrors, and all sorts of long tables with tight seating and well-dressed and coiffed waiters darting about with orders. While pleasant enough, we opted for one of the rather nice umbrella-ed tables located out front, enjoying a view of the University and the nearby Jardim da Cordoaria. 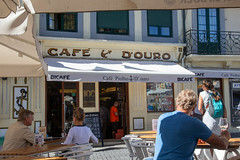 Menu-wise, Piolho is another great example of the standard Porto café menu: it’s a great place to pick up a Francesinha (or the related Cachorro, a hot dog served up similarly to the Francesinha), some basic Bacalhaua a Braga (salted cod with potatoes), or Prego em Prato (another Porto favorite, basically Steak Frites with a fried egg on it). But looking over the lunch special menu, we ended up both choosing a bowl of Caldo Verde soup and one of the specials (Febras de Porco for me, Carne de Peru for Carol). Like I mentioned back in my review of LBV 79, Caldo Verde has always been a favorite of mine, and one of the delights of Portugal is finding this simple and tasty soup everywhere (indeed, the amount of dinosaur-scale kale I also saw in gardens around Portugal was nice as well). 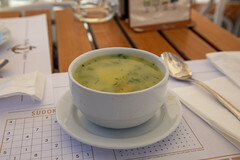 And the soup at Piolho was no disappointment; a simple but rich mix of onions, potatoes, kale, and a bit of sausage. Especially since this bowl only costs a bit over a Euro. Next up was my Febras de Porco. 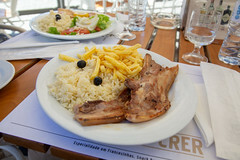 A simple dish of two shoulder-cut pork chops, grilled with a light garlic sauce and served up with ample portions of both rice and fries, this was a great example of another affordable but pleasant meal: like the French and their Steak Frites, the Portuguese seem to be particularly adept at simple grilled-meat dishes, and this was basically just two shoulder chops with a light marinade grilled up to perfection. Some rice and potatoes to round it out, and this was a pleasant lunch. Carol opted for the Carne de Peru. Portuguese for “meat of Peru”, that’s actually Portuguese for “Turkey”, but aside from the choice of meat (grilled fillets of turkey) and the inclusion of a simple salad, this was basically a “Turkey” version of my Febras, with a nice bonus that while us Americans love our turkey, grilled turkey fillets aren’t all that common in our restaurants, and it was nice to see this variation. 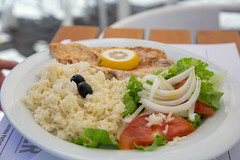 Overall, we liked Piolho. It’s definitely aimed a bit towards tourists with somewhat higher prices (we ended up around 7 euros each with beverage, when there are similar cafés nearby where we’d come in under 5), but it’s a pleasant enough café, with very good hours (it’s open almost 24 hours, closing at 4am and opening again at 7am), with a rather nice outdoor patio by the University. I wouldn’t mind a return trip.